We created a clinic in a remote mountain region of Haiti called Fanmi LaSante in 2010, the year of the disastrous earthquake. The clinic is in the Cabaret region, 60 miles outside Port Au Prince, and 10 miles along a road only accessible by a bush vehicle in a central village called Desab. The clinic serves a nine village cooperative which includes approximately 6,000 people scattered across the mountains. The original organization that I worked with in 2010 and 2011 to develop this clinic was COTY (Church Outreach to Youths). The organization dissolved in 2012 and a new 501-3C was created called Stone by Stone (SBS) which assumed responsibility for Fanmi LaSante. This is the team I went with on this most recent mission from April 4th -12th. My 16 year old son Matthew was in attendance as well, and worked in the school and assisted in the clinic scribing my notes. It must be noted that access to health care by these mountain villagers is very limited. If acutely ill they must pay for transportation to Port Au Prince, and may not have access to a public hospital. The private hospitals charge for meals, hospitalization, physician fees and all medications and supplies – a cost that no villager can afford. The clinic holds one full day of clinic hours each week which includes a nurse doing the intake, a pharmacist to dispense medications, a local Haitian physician, and a clinic administrator. All are paid for by SBS, and work 3 days a week when a US mission arrives a minimum of 4 times a year. The clinic typically sees 60 patients per day. The patients vary from acute visits, well child and adult visits, Obstetrical visits, to occasional critically ill visits. The other functions of the clinic is an immunization program run by the nurse and intermittently subsidized by the Haitian government. It also conducts monthly educational sessions for the each of the nine village’s representative Health Agent. Topics include prenatal care, contraception alternatives, water purification etc. 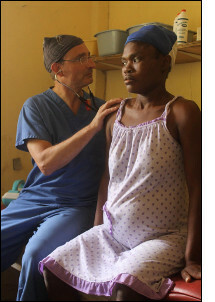 A floppy 3 month old boy weighing under 7 lbs., who was obviously a premature birth with failure to thrive, was seen by our Haitian physician. He was transferred to a public hospital with transportation was paid for by a team member. A boy who was in for a “cold” along with the rest of his family. The teacher, who happened to have followed him in to the room, asked if he could walk. Embarrassingly, while focused on his upper airway, I failed to realize that he had a disabling valgus deformity. We arranged for his surgery and paid for his transportation. A man showed up at the guest house with a two week old machete injury on his arm. It was a 10cm long infected gash down to muscle. I cleansed it, did some minor debridement, bandaged him and gave him 10 days of antibiotics. There were other such situations but I believe this gives you a flavor for what we were up against. One of our clinic days was spent in a set on a plateau higher in the mountains. It was about a 90 minute hike---so beautiful. The clinic is now building a septic tank, toilet, shower, and sink in order to get certified by the Haitian government, affording greater and more consistent subsidization. What one realizes is that you can only take small steps in Haiti or any third world country for that matter. Health care and public health are inseparable from economics, culture, religion, education etc. The greatest thing have brought to this clinic is hope!